I think one of my favorite things about the holidays is how festive my mom is. She gets so excited to decorate the house, make fun treats, and just go all out. She was Pinterest before it existed! I still loving going home and seeing decor we helped make as kids hanging up all over the house. So many fun memories! Seriously, how cute is that? And delicious too! One of my mom's recipes from yesterday is so simple, she gave me the recipe to share on here. It is from Kraft, but their recipe calls for a graham cracker crust on the bottom. I'm sure that would be yummy, but my mom's is just as good without it! Stir boiling water into gelatin in large bowl for at least 2 minutes until completely dissolved. Add enough ice to cold water til it measures 1 cup. Add to gelatin; stir until slightly thickened. Remove unmelted ice. Add whipped topping; stir with wire whisk until well blended. Stir in chopped strawberries. Pour into serving cups. Refrigerate 6 hours or overnight until firm. Top with sliced strawberries. We also added some Cool Whip and blueberries around the edges for the holiday! My mom has made this with orange Jell-O and mandarin orange slices too, and that is amazing! 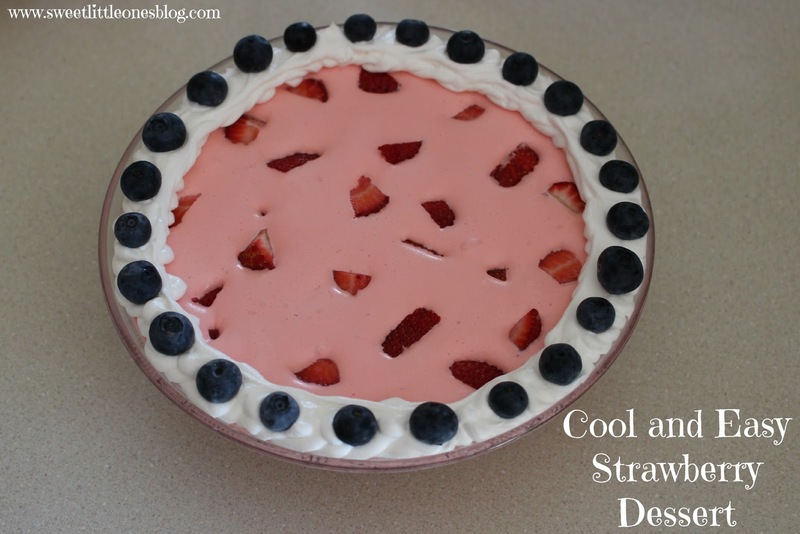 Like I said, it's so easy and delicious for a fun summer party! We hope everyone is enjoying the holiday, and most importantly, remembering all who have served and died for our country.